I used to be one of those people who thought Catholics went way too crazy with the whole Mary thing. I mean, she was nice and all, good for her she got to be Jesus' mom. But really, Jesus was the one who matters and any attention given to her was distracting from him. Right? There is only so much devotion to go around. I decided to put a little post together with some of the simpler reasons I think I was really really wrong. There are tomes written on the subject and certainly you could read plenty of ancient and modern Theology alike about the subject but consider this an easy-to-read, perhaps a bit more digestible post for someone wondering why we make such a big fuss over a Jewish girl who live two millennia ago. When I say I am a Christian, it means I follow Christ. I want to be like him and be conformed to him. He, as a perfect follower of the Jewish law, honored Mary, his mother, as per the fourth commandment. He came not to abolish the law but to fulfill it....to make it a matter of the heart and not just rules and regulations. This means that he loved Mary deeply with his heart. I, as one who follows Christ, will, too. God's plan is not haphazard. He is pretty smart and He knows all of eternity at once. He chose Mary SPECIFICALLY for the task of carrying His Son within her. He could have chosen anyone but He found her worthy. He could have come into this world in any crazy way but He chose a specific Jewish woman and He was LITERALLY connected to her via umbilical cord and placenta. The blood that would redeem the world was pumping inside of her. It only makes sense for that unfathomable honor to be recognized by the Church. In the Old Testament the Ark of the Covenant was revered. Only certain people could touch it and often it was covered so that the people could not even see it. When the temple was built, the Ark was placed in the Tabernacle and only the high priest was permitted to enter once a year. It was that important. It was important because it was overshadowed by the Presence of God (Shekinah) and because it contained manna (the bread from God) and the stone tablets of the ten commandments (the law from God). In a beautiful fulfillment of this, Mary is deemed the new Ark of the Covenant... overshadowed by the Holy Spirit so that she could literally carry THE Bread of Life, THE Way and Truth within her body. Just as the Hebrews reverenced the Ark for its role as carrier of the signs of God, we, too, reverence Mary as the New Ark of the Covenant, carrier of God Himself. Sometimes we limited humans think that acknowledging someone else's gifts somehow detracts from our own. We women are really bad with this sometimes. Mary had the unbelievably honored position as the only woman on earth who would bear the God-baby in her very womb, birth Him into this world, feed Him from her breast, change His diapers, and who would have GOD call her Mama. How cuh-razy that we would think acknowledging that honor somehow detracts from God. HE'S the one who chose her. It seems to slight him if we choose not to acknowledge that fact or stand in awe of the incredible grace (gift) that was hers. When the Holy Spirit overshadowed Mary, He impregnated her with a very real baby. It is from that reality we get the title "Spouse of the Spirit." To me, this is one of her most beautiful titles. She was a virgin and that conjugal act wed her to God. Any husband worth his salt defends his bride, honors her, loves her, recognizes her beauty and wants others to do the same. The Holy Spirit, God, wants the same from us for His chosen bride. At the visitation to Elizabeth in the book of Luke, Mary herself exclaims "all generations will call me blessed." This certainly isn't the type of blessed that we use in reference to a new job or having a full pantry almost interchangeable with lucky. "Yep, we're very blessed." This blessed is probably a bit different, wouldn't you say, I mean if it's going to last for "all generations?" 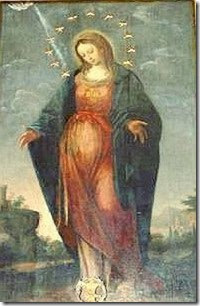 In fact, it is Elizabeth who then calls Mary "blessed among women" meaning she was chosen and she reverences that fact. How is it anything other than Scripturally valid to acknowledge that she, indeed, is the Blessed Virgin Mary? I remember an evening long ago when my mom rounded up us kids to pray a family Rosary. I balked and in my self-righteous stubbornness (and hilarious ignorance) I refused to pray the first line of the Hail Marys. I felt like it was worshipping Mary to pray Hail, Mary. Ahem. Silly girl. The Hail Mary is taken directly from the Scriptures I claimed to have been defending. The angel Gabriel greeted the young virgin with "Hail, Full of Grace (or highly favored one), the Lord is with you." Hail (Ave) was the greeting reserved for someone in authority or prestige or for royalty...as in Hail, Caesar! And the archangel uses it for a lowly peasant girl. The next part of the prayer is taken directly from Elizabeth's response to Mary's Magnificat: "blessed are you among women and blessed is the fruit of your womb, (Jesus)." The Word of God becomes our prayer. "Holy Mary, Mother of God, pray for us sinners, now and at the hour of our death." This is the conclusion of the prayer and it reflects the Catholic understanding that Christ has conquered death and that His Body, that is, the Church is not broken by death. We can still be in union with those of the faithful who have passed into eternity. And they, existing perfectly in Love, still partake in love and share that love with us through their intercessions. As for that Mother of God part, well, that was determined to be one of Mary's titles WAY back in the third century by the Church Fathers (those guys that were way more connected with what the Apostles really taught). It's simple, really. If Jesus is God and Mary is His mom, well then, Mary is mom of God. Denying that turns you into a Nestorian and that means you believe that Jesus had two separate natures and pretty much, you can't call yourself a Christian. It was condemned at the Council of Ephesus back in 431. The conflict had little to do with Mary and much more to do with solidifying who Christians actually believed Christ to be. Christ is fully God and fully man. This Mother of God title is what the Church recognizes and honors today. Mary, as mother of Jesus became mother to God. Jesus is not a split personality and He is fully divine. The honor we pay her today serves to highlight the mystery and beauty of the Incarnation and the deity of Jesus Christ. Because, in the end, it is all about Him...and she wouldn't have it any other way. Mary, Mother of God, pray for us. I liked this post and I "liked" it - but I don't really know what that means. It might mean you'll show up on my facebook list of likes? Anyway, I appreciated this list a lot. After Mass this morning, I totally forgot about the Feast... until now! My fav response to why Catholics have such reference for Mary came from Bl. Teresa of Calcutta. She stated, "No Mary, no Jesus." Beautifully simplistic and true! and "Know Mary, Know Jesus"! I love our Lady...love love love. My Mom really instilled that love for her in us as kids. We prayed a family Rosary every night at 7 pm and were consecrated to her at our Baptisms and on our own as we grew up. EVERYTHING my Mom does starts by asking Mary's intercession, whether it's looking for a new car, finding a job, or praying for a friend's surgery (she'll ask Mary to guide the surgeon's hands). I think having a good relationship with my own mom makes it so easy to have a good relationship with my Heavenly Mom! Beautiful post. One of the priests at our parish recently explained in a homily how Mary is the Mediatrix of all Graces. He said we cannot receive graces from God except through Mary. He said to think of Mary as the neck of the body and God as the head of the body. Prayers and Graces pass through Mary first before anyone else. I had never heard it put that way before. Where in the Bible does it say any of that? Or did your priest just make that up? Jon, it doesn't say that word for word in the Bible. But neither is the Trinity or, in fact, what is considered the canon of Scripture. So if you only believe what is explicitly listed in the Bible as true then you wouldn't even have the Bible itself. Her priest didn't make that up. It has been a theological pondering for years and an understanding of the Church. God from all eternity in HIS perfect wisdom chose to enter the world through Mary. SPECIFICALLY Mary. Jesus took His human body, His DNA, from her. God chose to need her cooperation and without that we would not have Jesus as we know Him. 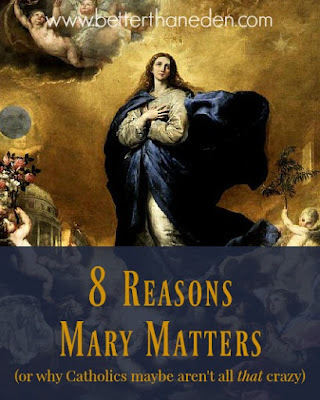 Since grace flows through the world from Jesus, then we can easily say that Mary was and is the conduit through which God chose to bring those graces to the world. Have you really thought about what you have said? If you continue with your line of reasoning that makes Mary (Jesus mother) incestuous. You say she is the spouse of the Spirit yet she is the mother of God. How can she be the mother to the one who created her? So she was created by, impregnated by and mother to God? I was raised Catholic. Then I started thinking things out for myself. Too many things about Catholicism do not make sense. I admire your faith but it needs to be in God the Creator and Him alone. It was Jesus who suffered, died, was buried and rose again to pay for our sins. Mary was only a vessel to bring Him into this world. She does not answer prayer, she does not intercede for us. Jesus is big enough to handle all our prayers, Mary is not. If you love Mary as you and these other say then why would you burden her with all your prayers. I believe Mary the mother of Jesus is in heaven. Heaven is a place of peace and no sin. Why would you want to bring our sinful problems to a person in heaven? When I was in the navy we had a small space on the ship that was turned into a chapel. I stopped in one day to have a quiet moment. There was a women in there in serious prayer. She needed to get in touch with God. I marveled at how the Lord can take the time to hear her very serious prayer and my not so serious quiet moment and address both of us. Not to mention the billions of people in the world who are praying to Him. How could Mary do that? She can not. I do not mean to be offensive but I felt I must share the truth. Lol, yes, I've thought about it for much of my life ;) We are bound by many things on this earth and in our thinking. God is not. God can choose to use whomever He wants to work in the world and in heaven. On her own, of course Mary is not able to do any of these things. None of us could pray or do anything good without His grace. God could have chosen any infinite number of ways to enter the world and redeem it (or not to at all) and yet He chose to enter through the real womb of a real woman. If you don't believe that she is the Mother of God and the Spouse of the Spirit then you misunderstand who Christ is - Fully God, fully Man.